And immediately something like scales fell from his eyes and he regained his sight. Then he rose and was baptized... And in the synagogues immediately he proclaimed Jesus, saying, "He is the Son of God." Now as he journeyed he approached Damascus, and suddenly a light from heaven flashed about him. And he fell to the ground and heard a voice saying to him, "Saul, Saul, why do you persecute me?" And he said, "Who are you, Lord?" And he said, "I am Jesus, whom you are persecuting; but rise and enter the city, and you will be told what you are to do." Abby must have had a similar experience. Afterwards Abby had to gradually do what Jesus asks of all of us, "If your right hand causes you to sin, cut it off and throw it away." (Matthew 5:30) She had to cast out her old self; her old way of seeing and doing and thinking. You can see the difference in the two interviews which I provided videos for in my last article. In the first one with Mike Huckabee she is still partially thinking like her old self, but in the more recent EWTN interview it is apparent that she has been transformed from the inside by the Grace of Christ. She says that after she saw the child dying in front of her eyes in the mother's womb that her heart changed. 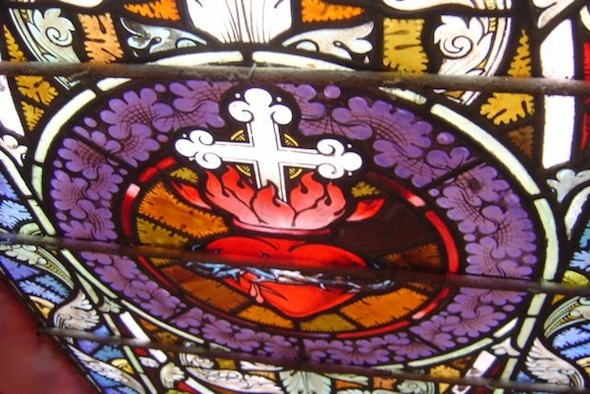 It was as if her old hardened heart was instantly melted by the warmth of the flames emanating from the Sacred Heart of Jesus. It was not enough that she saw something in the ultrasound. She should have been well prepared for that. It should just have added one more calloused layer over her hardened heart. The fact that it had the opposite effect she herself attributes to the prayers of those who stood in prayerful vigil outside the clinic. Now it is her turn to pray for those who are still caught in the tangled web of lies that Planned Parenthood uses to deceive them. "When you pray, go into your room and shut the door and pray to your Father who is in secret; and your Father who sees in secret will reward you." Recently I have been reading from the Book of Isaiah. Here are a few verses from Isaiah 49 that may help you in your prayers for the unborn children. They were written for a time when the people of Israel were held captive in Babylon. And yet they seem to speak directly to us as we struggle to uphold our Christian beliefs in a culture that has rejected Jesus Christ, the anointed Son of God. Listen to me, O coastlands, and hearken, you peoples from afar. Israel, in whom I will be glorified." and that Israel might be gathered to him. and by springs of water will guide them." make room for me to dwell in.' "
and I will save your children." After reading Abby's description of her experience, I can see even more parallels with the conversion experience of St. Paul. He was convinced that he was doing the right thing by persecuting Christians, while Abby was convinced that she was doing the right thing by helping women to abort their children. ABBY (from unPlanned): The image was complete. I could see the entire, perfect profile of a baby.... I had a sudden urge to yell, “Stop!”.... I looked at my own hand holding the probe. I was one of “them” performing this act.... and then it was gone. And the uterus was empty. Totally empty. I was frozen in disbelief. Without realizing it, I let go of the probe.... I could feel my heart pounding.... I felt too stunned and shaken to move…. The image of the tiny body, mangled and sucked away, was replaying in my mind.... [I] fumbled to get [the probe] back into place. But my hands were shaking now…. My eyes traveled back to my hands. I looked at them as if they weren’t even my own.... How much damage have these hands done over the past eight years? … What if I’d known the truth, and what if I’d told all those women? … I had the sense that I had just taken something away from her with that hand. I’d robbed her. And my hand started to hurt — I felt an actual physical pain. And right there, standing beside the table, my hand on the weeping woman’s belly, this thought came from deep within me: Never again! Never again. St. Paul felt himself go blind; Abby felt pain in her hand. St. Paul heard a voice say "Why do you persecute me? "; Abby thought "How much damage have these hands done?" St. Paul heard the voice say ""I am Jesus, whom you are persecuting. "; Abby heard a voice inside her say "Never again! Never again." Marie. I'm glad you got out of the situation you were in, regardless of how it came about. At least you know now that you wouldn't put yourself in a similar situation ever again. 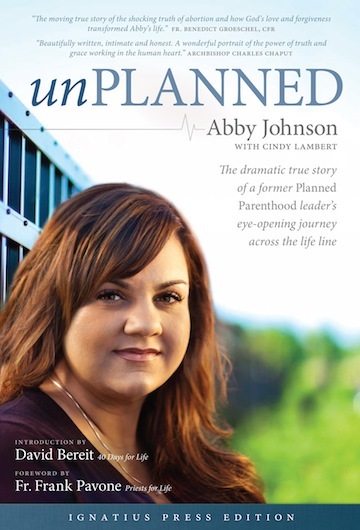 As Abby Johnson says, "Never again! Never again." We all have to make some compromises in our lives in order to survive. Sometimes that may mean going against our principles in order to provide for our families. We should try to minimize those compromises, but let's face it life is very complicated and it is nearly impossible to avoid all moral hazards. Lent is a time when Christians are called to seek to renew their faith through sacrifice, prayer and fasting. Through these spiritual exercises we can try to overcome our weaknesses and shortcomings and achieve a higher level of spiritual perfection. Just so you know, I have not been doing very well with my own Lenten devotion. In fact I seem to have taken a step backwards in my commitment to prayer. Hopefully, this is a temporary setback and I can get back on track. I know that I need to go to confession even though I keep putting it off. I would suggest that you do the same thing, especially now that you have finally escaped from your employment situation. Michael, I have a short story to tell you. Two days ago we had a health fair in my college. There were many good stands to prevent diseases and promote a health culture. However, Planed Parenthood was among them. I couldn't help to go and ask questions, I wanted to know what they would answer. These are my impressions. 1. All the colors were girl oriented, such as pink, violet and blue. 2. The design of the cards that they offered me looked more like a department store. This including the condoms, with trivial designs with pink and silver. This may seem irrelevant, but design is a powerful tool. The Planed Parenthood stand from the outside looked inoffensive and "chic." In one side there was a pile of condoms and to the other side cards with two options; contraception and abortion. I was shocked about how blatant this was. I asked the girl in the stand if Planet Parenthood performed abortion, she said yes. I asked her if it was legal, she said yes. She hesitated a moment while speaking about the baby, calling him a fetus. I could see how she struggled for a second while talking. I asked her as a personal reference when does she think that a baby is a baby, she said that each person has it own view but she think that it is only when the baby is on the outside and can breathe on his own. The experience was surreal Michael, one thing is to read about it, other is to see it in front of you in your college. After the chat a shuttle pain started to grow in my, for all the lost lives. Now more than ever I understand the insistence of the Catholic church in this matter. And it makes me proud, to see that my church stands for life and fights for it. Ride. I would like to reply to your comment in a post. Don't worry I will clean up some of the minor spelling errors and such. Do I have your permission? OK. Thanks. I'm already started working on it.